Schedules & Fares – Subject to change without notice. All Fares Are Subject To A 7% Historical Preservation Fee. Passengers can make changes to their reservations up to the day before their ride. Change fee is $6 per ticket. If there is an error during the original booking, customers must call the reservation office within 2 days of the reservation to avoid being charged the change fee. Cancellations made 48 hours prior to the trip date are refundable with a cancellation fee of $14 per adult and $7 per child. Cancellations made after the 48 hour deadline are non-refundable. Purchases made through 3rd Party or Discount companies or websites are NON-Refundable and the above cancellation policy does not apply. A valid American Express, Discover, Mastercard or Visa credit card number is required to make an online reservation. Full payment is required at time of booking. Passenger credit card will be charged for the full amount within 24 hours of the booking. Passenger tickets are available for pickup at the depot of origin prior to the departure of passengers train or bus. Passenger may pick up tickets between 7:30am & 9:30am the same day of passenger train (bus) ride. Please have passenger reservation number available. For maps and driving instructions to our depots, click here. We will do our best to honor Premium Parlor and Deluxe Tourist seating assignments. However, due to the substitution of equipment or other reasons, it may be necessary to move seat assignments. If that should occur, we will call those whose seats have been moved prior to the ride, if there is time. Classic Coach seating is assigned automatically by the reservation system. We will do our best to assure that your group is seated together. If there is an issue the day of your ride, please let us know at the ticket office. If booking with multiple families please make a note in the comments regarding the names of parties to be seated together or call the reservations office. WE RESERVE THE RIGHT TO CHANGE SEATING AND/OR TRIP ASSIGNMENTS DUE TO EQUIPMENT FAILURE, BUS CANCELLATIONS, INCLEMENT WEATHER, ETC. WE WILL MAKE EVERY EFFORT TO INFORM PASSENGERS BEFORE SCHEDULED TRIP, IF POSSIBLE. 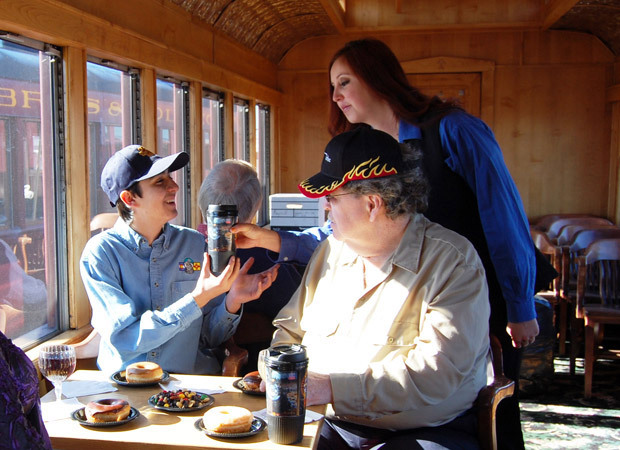 Regular Daily Excursions include a hot lunch at Osier Station. 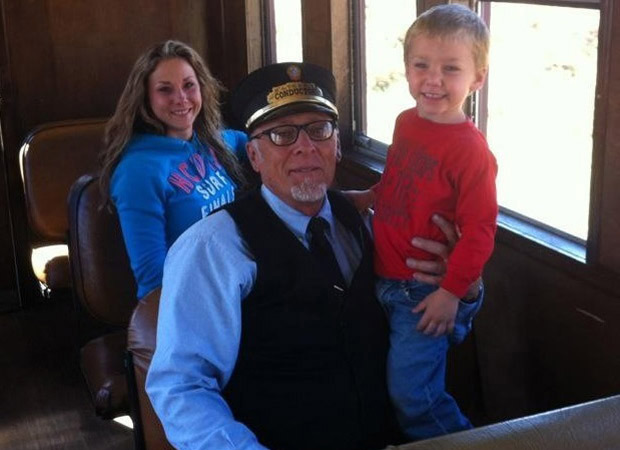 Cinder Bear Experience and the Cumbres Express trains include a picnic lunch. The discounted kids price applies to ages 2-12. All children must be accompanied by an adult. Babes-in-arms under 2 years of age will not be assigned a seat, and there will be no charge. 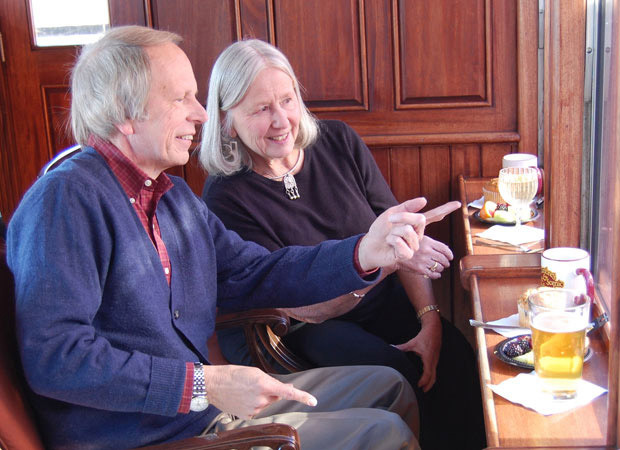 Parlor Car accommodates adults only (21 and over). If there is a question about age, Parlor Car Attendant or other RR staff may ask for proper identification. We have wheelchair lifts available in Classic Coach seating and our motorcoaches. Please make passenger reservations at least 7 days in advance of departure and notify us at 1-888-286-2737 or at info@cumbrestoltec.com to schedule your ADA accommodations. For your comfort, the Cumbres & Toltec Scenic Railroad recommends that you consider the following when planning your trip. The mountains can bring about sudden changes in the weather. It is important to wear layered clothing and in the late summer and fall, bring a jacket. Sunscreen and ball caps are also suggested to protect you from the stronger sun rays. Wearing sturdy, enclosed toed shoes is also important to protect your toes and ankles when in the yard and on the train. If spending time in the open gondola car, it is very important to wear protective eyewear to protect against cinders getting into your eyes. Sunglasses and prescription glasses are fine. We also sell wrap around safety glasses for your convenience. COACHES ARE NOT HEATED. The average elevation is approximately 9,000 feet above sea level, with a low of 7,863 feet and a high of 10,015 feet, which is our summit, Cumbres Pass. To help counter altitude sickness, guests are encouraged to drink plenty of water and avoid alcohol, caffeine and avoid skipping meals. Please check with your physician if you have any health concerns. While every effort is made to maintain our schedules, mechanical and/or weather conditions may cause delays. The Cumbres & Toltec Scenic Railroad will not be held liable for any delays. The Cumbres & Toltec Scenic Railroad includes a 7% historic preservation fee to all transactions. This fee is used exclusively for the restoration of historic equipment and buildings. 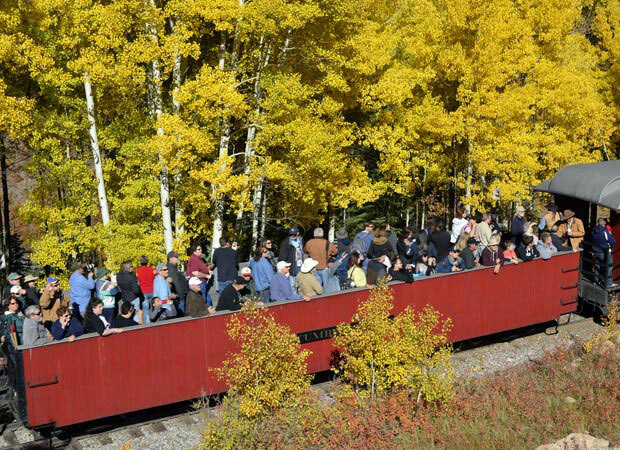 The Cumbres & Toltec Scenic Railroad will use identifiable photographers on the trains from time to time. It is assumed that the C&TSRR will have the right to use any recognizable image and video of its passengers in its marketing efforts. If you are photographed by our identifiable photographer and would prefer that the images or video not be used for public display, please let the photographer know at the time of the occurrence. Firearms are prohibited on any railroad property. Parking on any railroad property is at your own risk. Any substance/substances that are prohibited by federal law are not permitted aboard any train or on any railroad property. The Deluxe Tourist Car offers first class service to children of all ages! Travel the Cumbres & Toltec in comfort, yet economical style! Everyone is welcomed to ride in the Gondola Car. Open-air with amazing views!